One of the strengths of the Horus Heresy BL series is that they can take battles and characters that previously only existed as bullet points in codex timelines and flesh them out into proper stories. Thereâ€™s a lot of material here, and potentially dozens of different viewpoints, aside from also (eventually) depicting the single most important event in the whole canon. And itâ€™s that â€˜eventuallyâ€™ thatâ€™s forming the problem. Iâ€™ve written before that the HH series does a nice job of setting aside the typical grim nature of the 40K universe and focusing on the early days, back when most of human civilisation wasnâ€™t on fire. Knowing how things are going to turn out, itâ€™s gut-wrenching to watch characters blindly walk into mistakes, to see all the missteps and betrayals play out in front of you. However, there is a limit on this, and ‘Fear to Tread’ is teetering on the brink of it. 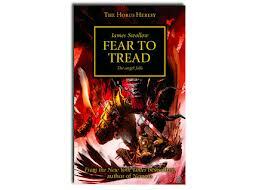 The book focuses on the Blood Angels Legion and their primarch Sanguinius, who are in safe hands with author James Swallow, who has been almost exclusively dealing with the Angels for the last few years. 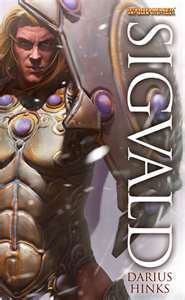 This is probably the best Angels novel Swallow has written to date; there are some excellent characters (my favourite being two of the main antagonists and their endless bickering) and some quite sinister moments, even if Sanguinius is a bit lacking in character. Itâ€™s said roughly every two paragraphs that he is special, and angelic, and wonderful, but heâ€™s not half as well characterised as some of the other HH characters. If youâ€™re a particular fan/collector of the Blood Angels or youâ€™re looking for something to tide you over until the next HH release, then youâ€™ll enjoy this. Just donâ€™t expect it to soar.